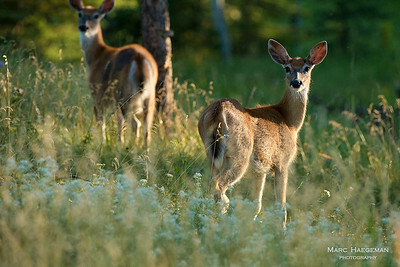 During morning or evening hikes you can always run into some wildlife in Custer State Park. like these gorgeous does. 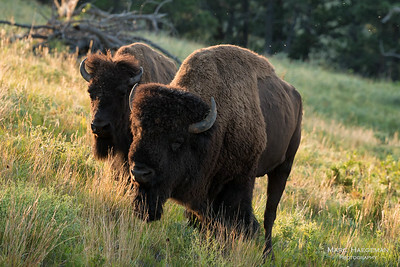 Unlike your regular cow, bison can be deadly dangerous, especially in the rut when testosteron-packed bulls think of one thing only. This big male charged heedlessly past the car, seconds after this picture was taken. 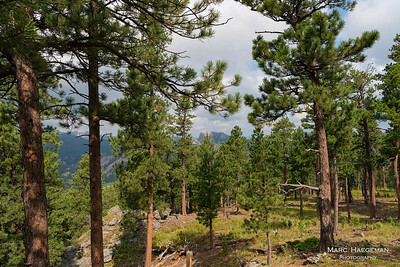 This popular lake in the Black Hills was created in 1881 after Theodore Reder built a dam across Sunday Gulch Creek. 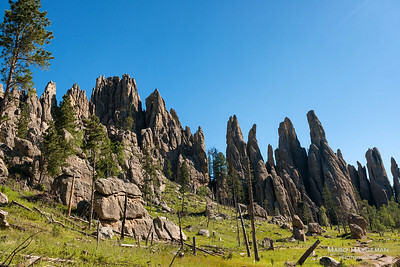 Striking granite formations, recalling gothic cathedral spires. 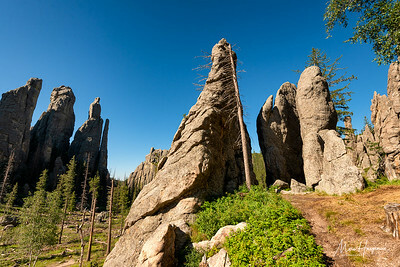 Cathedral Spires in Custer State Park. The rock formation on the left could be called the eagle. Accidentally discovered in 1974, this site in Hot Springs, South Dakota is the largest repository of Columbian mammoths in North America. 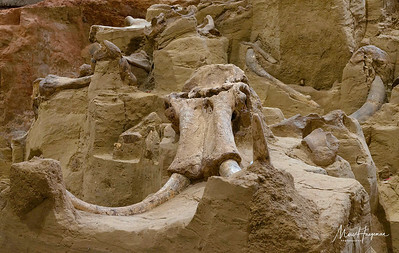 To date 60 complete mammoth skeletons have been dug up. It all started some 26,000 years ago when a male mammoth slipped into a sinkhole to perish in the bottom. The tragedy was repeated several times over the years and before the pond filled in at least 100 elephants had died. 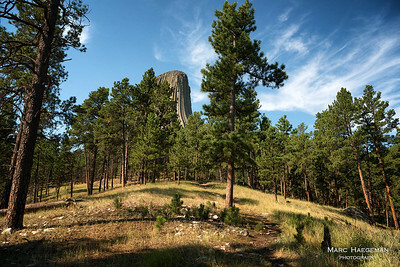 Devils Tower National Monument is a striking flat-topped volcanic formation looming 1,267 feet (or 386 meters) above Wyoming’s eastern plains. One of the USA's most iconic monuments, Mt. 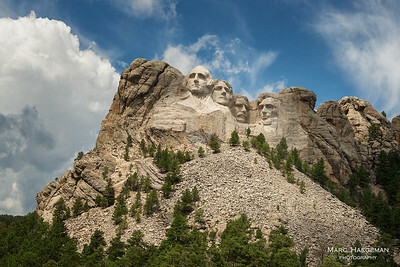 Rushmore was sculpted by Gutzon and Lincoln Borglum between 1927 and 1941. The busts of four presidents Washington, Jefferson, Th. Roosevelt and Lincoln stand 18 meters tall. The monument featured in an unforgettable climactic scene in Alfred Hitchcock's North by Northwest (1959) starring Cary Grant. Pigtail bridges, switchbacks and narrow stone tunnels framing Mt. Rushmore turn the Iron Mountain Road (US 16A) in a top scenic drive. 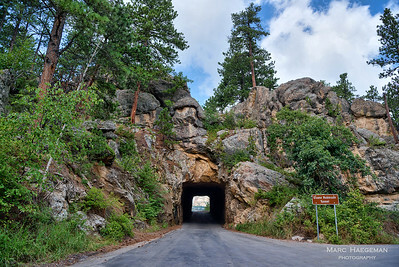 As so much in this area the road was devised by Peter Norbeck, South Dakota’s first governor and U.S. senator hailing from the state, in the 1930's. 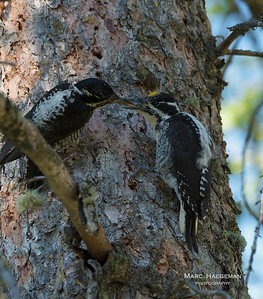 With the epidemic of the mountain pine beetle in Western North America, the three-toed woodpecker and the blackbacked woodpecker are considered the local heroes, since the wood-boring pests are primarily on their menu. A male is feeding his chick larvae.